Map projection is the process of transforming angular (spherical / elliptical) coordinates into planar coordinates. All map projections introduce distortion (e.g., to areas, angles, distances) in the resulting planar coordinates. Understanding what, where, and how much distortion is introduced is an important consideration for spatial computations and visual interpretation of spatial patterns, as well as for general aesthetics of any map. This entry was published on June 25, 2017. This Topic is also available in the following editions: DiBiase, D., DeMers, M., Johnson, A., Kemp, K., Luck, A. T., Plewe, B., and Wentz, E. (2006). Projections as a map design issue. The Geographic Information Science & Technology Body of Knowledge. Washington, DC: Association of American Geographers. (2nd Quarter 2016, first digital). What is a map projection? map projection: transformation between angular coordinates and planar coordinates. coordinate system: a method of assigning a unique index to mapped locations, typically in the form of an east/west value and a north/south value, and possibly an elevation value. developable surface: a surface that can be flattened to a plane without introducing distortion from compression or stretching. conformal: a map projection that preserves local angles. equal area (or equivalent): a map projection that preserves relative areas. compromise: a map projection that balances between area and angular distortion to emphasize aesthetics over specific map properties. standard line: a line on a map projection along which the scale factor is 1.0. A standard parallel is a standard line that runs along a line of latitude. central meridian: the middle longitude used in the map projection; divides the east to west extent of the mapped area in half. scale factor: the ratio of the map’s scale in a given direction to the true distance on the globe; values greater than, or less than, 1.0 indicate distortion. 2. What is a map projection? where λ is the longitude, λ0 is the central meridian, φ is the latitude, and R is the radius of the reference globe. Figure 1. Plate Carrée map projection. In this projection, angular coordinates are treated as if they are planar coordinates, and if we simplify to assume R = 1.0, we end up with a coordinate system that ranges from -180 to 180 on the x-axis and from -90 to 90 on the y-axis, exactly the same as the range of degrees for the angular coordinates. Most map projections are more complex than this, though they all serve the same purpose to define the transformation relationship. There are many excellent resources for learning about the mathematics behind the transformation process (e.g., Richardus and Adler 1972; Snyder 1982; Maling 1992). The map projection selected has significant impact on visual analysis and on any calculations that are made using the projected planar coordinates (e.g., calculation of distances between locations, etc.). While the map projection process is mathematical, it may be helpful to also think about projections in terms of their construction via developable surfaces. A developable surface (Figure 2) is a surface that can be flattened to a plane without introducing distortion from compression or stretching. There are three developable surfaces: planes, cones, and cylinders. With respect to projections, these surfaces can be used to ‘wrap’ a reference globe, and, with an imaginary light shining on the reference globe, the shadows of the features of the globe are transferred onto the developable surface. After the features are transferred, the developable surface is ‘unwrapped’ from around the reference globe. Where the developable surface touches or passes through the reference globe, the scale factor is constant (sf = 1.0). There is further discussion of scale factor in the next section, Distortion in Map Projections. The developable surface may be placed on/around the reference globe in any orientation (e.g., wrapped around equator, transverse (aligned along a meridian), passing through the ‘surface’ or entirely outside, etc. ), thus shifting where in the projection the globe’s features fall. 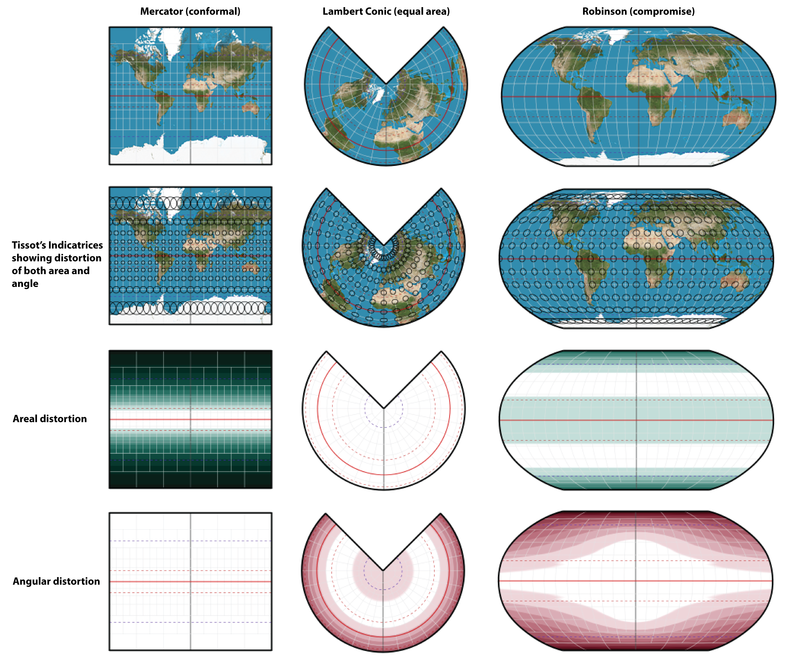 While the concept of developable surfaces provides a nice way to visualize the basics of map projections, as stated before, the transformation is really driven by mathematical equations. Figure 2. Developable surfaces for forming planar (left), conic (middle), and cylindrical (right) projections. For each developable surface a point or line of tangency is shown in grey. For the planar developable surface it is at the north pole, for conic it is at 45°N, and for cylindrical it is at the equator. Whenever coordinates are transformed from 3-dimensional angular to 2-dimensional planar coordinates, spatial relationships are distorted, as compared to their relationships (measurements) on the Earth’s surface. Either angles or areas or both must distort, as well as distances and many other kinds of measurements. 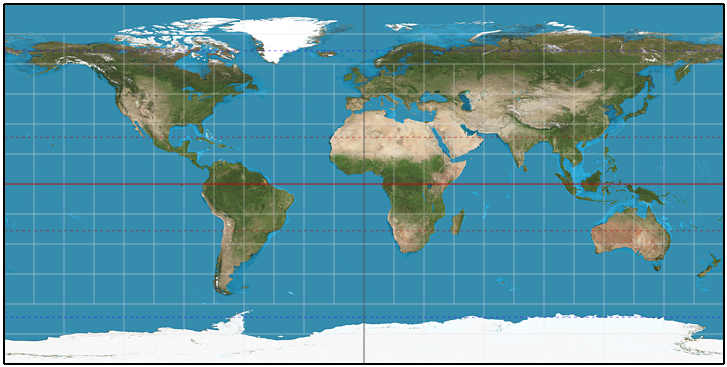 For a map projection, the cartographer may adjust the placement of standard lines(s) and / or the central meridian (location of the east-west center), to shift the amount and type of distortion across the projection. azimuthal – preserve directions from the center to any other point on the plane. conformal – preserve local angular relationships across the projection. equal area or equivalent – preserve relative areas across the projection. Scale factor can be used to quantify distortion in map projections. Scale factor at a point on the map is the ratio of the map’s scale in a given direction to the true distance on the globe. Unless the map is conformal, a point’s scale factor varies according to direction The calculation for any point on the map will provide assessment of how much deviation from principal scale exists at that point. A scale factor of 1.0 indicates no change in scale at that location; values greater than 1.0 indicate an exaggeration of scale – distances have been enlarged, while a value less than 1.0 indicates a reduction in scale – distances have been reduced for this location. There are many methods for visualizing distortion in map projections (Mulcahy and Clarke (2001)). Judy Olson also presents a set of guidelines for visual detection of distortion to area and angle (Olson 2007). A few common methods of visualizing distortion are through using Tissot’s indicatrices (Tissot 1881) or generating continuous surfaces to show relative distortion. Tissot’s indicatrices are infinitesimally small, perfectly circular, ellipses drawn on the sphere. When projected onto the plane, the ellipses warp and the shift in size and shape of the ellipse provides graphical depiction of the distortion at each location on the map. The use of ellipses allows assessment of distortion using a familiar and simple shape, as opposed to trying to decode distortion using outlines of land masses. With Tissot’s indicatrices, where the ellipses maintain a circular shape after projection, the projection shows conformality at that location; deformation of the shape indicates angular distortion. The quantity of distortion can be measured based on the amount of deformation. When the indicatrices maintain equal areas after projection, the projection shows equivalence of area at that location. Another method of visualizing distortion is to calculate and visualize deformations to angular and area calculations at every point on the map. This creates a continuous surface of deformation (Figure 3). Figure 3. Visualizing distortion for projections using Tissot's indicatrices and shading relative quantities of distortion using continuous surfaces. For the continuous surfaces, darker shades are indicative of greater quantities of distortion. White shades indicate regions with no, or negligible, levels of distortion. There are an infinite number of ways to perform the transition between angular and planar coordinates, and each of these transformations will have specific purpose. The cartographer or GIS analyst must decide what properties of the projection are critical to preserve (e.g., area equivalence) at the expense of others (e.g., conformality), while still considering the overall aesthetics of the resulting map. Every cartographer and GIS analyst would like to find the perfect map projection; however, this mythical projection does not exist. There is no "best" map projection, only choices that may be better or worse for any specific analysis or visualization. There are several tools or sets of guidelines available to help with projection selection (e.g., Pearson 1984, Snyder 1987, Finn et al. 2017, etc.). For large-scale (local) mapping, many governmental organizations (e.g., country, state, counties, etc.) will recommend specific projections for use for mapping of that region. This helps standardize data and map visualizations across the region. Spatial analyses are typically done using projected, planar coordinates (Chrisman 2016). As all map projections introduce distortion of varying type and quantity across the surface of the projection, selecting a projection to minimize distortion to spatial computation is critical. When calculations are based on area (e.g., determining population density, or calculating tax rates based on size of parcel), an equal area projection is necessary. However, an equal area projection would not be appropriate for use when calculating navigational routes; in this case a conformal projection, preserving local angles, would be more important. Or, when considering calculations such as those use for creating "heat maps," relative distance between point locations is important to the analyses. Chrisman (2016) presents multiple case studies demonstrating the consequences of poor projection selection in spatial computations. While performing spatial calculations on the plane was a necessary part of the original GIS software packages due to the increased complexities of the calculations on the sphere or ellipsoid versus on the plane, there is a hope that newer systems will take advantage of our increasing computational power to move calculations for analyses over to the sphere to minimize the distortion in calculations. Regardless of whether spatial computation is done using planar coordinates (presumably in an appropriate projection) or angular coordinates, there will still be the challenge of visualizing the results to minimize distortions that impact a reader’s assessment of the spatial pattern (Figure 4). Unless the cartographer has ability to reproject on-the-fly based on specific user task, the cartographer will have to compromise in selecting a single projection for a given visualization. Ideally, a map projection is selected to minimize distortion to the properties expected to align most substantially with expected reader goals. Figure 4. 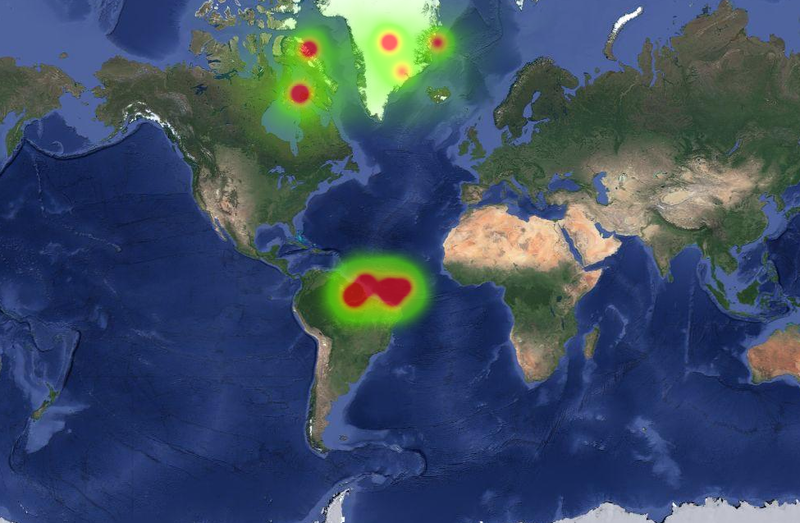 Results from calculating a heatmap using the Google Heatmap API to show relative clustering of point locations. The dispersed set of five "hotspots" in the north has the same geographic distribution as the data shown near the equator, however, the distortion in the Web Mercator projection shifts these points far enough from one another on the map so that they show a substantially different pattern. For example, if a map is intended to represent the import and export of goods between one country and the rest of the world, the cartographer might opt for a projection that preserves distances from the country of focus. With these distances preserved, the reader would have an appropriate sense of the relative distances for each imported or exported product to travel. For many small-scale (global) thematic maps, equal area map projections are recommended so that countries are given equitable visual importance across the map. There has been significant debate regarding the use of non-equal area map projections, specifically focusing on the use of the Mercator projection, a conformal map projection (see discussion in Monmonier 2004). Additionally, it may be of interest to change the parameters of a specific projection based on the theme of the map. Consider the land-based Goode’s homolosine vs. ocean-based in Figure 5. Figure 5. Goode's homolosine projection with parameters adjusted to present a land-based (left) and ocean-based (right) perspective. Note that for small-scale mapping there is an additional analysis challenge of visualizing spatial relationships between locations on the periphery of the map. Anderson and Leinhardt’s (2002) research has shown the difficulty many map readers face in identifying shortest path on projected maps. This problem is compounded when the shortest path is discontinuous due to crossing off the peripheral edge of the map and continuing in a visually disconnected location on the other side of the map, or at a different location along the northern or southern polar regions. For any given type of projection (e.g., equal area, conformal, etc. ), there are a multitude of options that can be selected. Each of these projections will look different, and ultimate selection will depend on the aesthetic considerations of the mapping project. For instance, one may decide based on size and shape of a final printed map, or based on a general preference for a specific look. Consider the equal area map projections in Figure 6– each may be appropriate for a different map, in a different medium, or for a different audience. Figure 6. Three equal area map projections: Goode's homolosine (left), Craster equal area (center), and Lambert equal area (right). When designing maps for distribution online, there are often limited options for selecting the projection for a given map. If the data is ‘mashed up’ onto an existing tiled basemap, the projection is likely to be the Web Mercator projection, a variant on the Mercator projection. The Web Mercator is a nearly conformal projection, and thus, has been suggested as inappropriate for many small-scale thematic mapping purposes (see Battersby et al. 2014 for discussion). The use of Web Mercator for web mapping applications presents serious limitations for both spatial analysis and visual analysis. However, in current web mapping environments, projection choice is often limited. Maling, D. H. (1992). Coordinate systems and map projections, 2nd edition. Oxford: Pergamon Press. Monmonier, M. (2004). Rhumb Lines and Map Wars: A Social History of the Mercator Projection. Chicago, Illinois: University of Chicago Press. Pearson, F. (1984). Map projection methods. Blacksburg, VA. Sigma Scientific. Richardus, P., & Adler, R. K. (1972). Map projections: For geodesists, cartographers, and geographers. New York, NY: Elsevier. Snyder, J. P. (1982). Map projections used by the U.S. Geological Survey. Washington DC: United States Government Printing Office. Snyder, J. P. (1987). Map Projections: A working manual. Washington, DC: US Geological Survey. Tissot, A. (1881). Mémoire sur la représentation des surfaces et les projections des cartes géographiques. Paris, France: Gauthier Villars. Describe the geometric properties of the globe that may be distorted in the map projection process. Describe at least one technique for visualizing distortion (e.g., Tissot’s indicatrices, or continuous distortion surfaces) and use it to visualize distortion. Identify and describe the distortion pattern in a specific map projection using a common visualization method (e.g., Tissot’s indicatrices) or distortion surface. Compare multiple map projections to explain the difference in distortion patterns, and how the maps would be suited for different analysis or visualization purposes. Design a thematic map that uses a map projection appropriate to the theme and map purpose. What is a developable surface? Is this how map projections are actually calculated? Describe the difference between the concept of developable surfaces and the mathematical transformations used for map projection. Describe the differences between an equal area, conformal, and compromise projection. Provide an example of a mapping problem that would be best suited for each type of projection. Why should a cartographer or GIS analyst be concerned about the map projection of the dataset when performing spatial analysis? When preparing a map for visual communication of spatial patterns? When selecting a projection based on property (equal area, conformal, etc. ), what aesthetic considerations guide the final selection of a map projection with the desired property? What are the projection-related trade-offs that a web map designer must face when working with tiled map services? Why is it impossible to preserve both area and angular measurements in a planar map projection? USGS Map Projections (https://egsc.usgs.gov/isb//pubs/MapProjections/projections.html): USGS web site presenting key properties, characteristics, and preferred uses of many historically important projections and of those frequently used by mapmakers today.